The siding on your home should not only look good, it should also be a durable layer of protection for what lies underneath. At LASK Roofing & Siding, Inc., we specialize in making sure that your siding is doing both of these jobs. Because we specialize in vinyl, steel and aluminum siding, you can be sure that we are qualified to assist with any problems or questions you might have concerning the exterior of your home. Does my siding need to be repaired? There are several signs that your siding may need to be repaired or replaced. Take a quick walk around your house and check to see if there are any loose pieces, any parts where your current siding is warped, buckled or cracking. Also, be alert for any signs of mold or mildew or small holes in your siding. All of these are clear signs that your siding is not protecting the structure of your home properly. Contact a siding professional immediately for a free inspection and consultation about your siding. How long should siding last? The siding on your home should last between 20-50 years, depending on the type of siding that is on your home, or the type of siding that you select for your new home. Will vinyl siding fade because of the sun? We install only high-quality vinyl that is fade resistant when exposed to years of harsh UV rays. Of course, over time a little bit of fading will occur, but it will be difficult to tell as the entire house should fade at approximately the same rate. 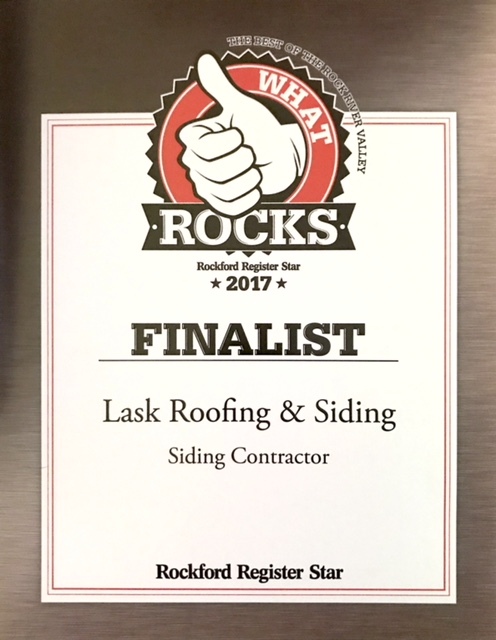 Contact LASK Roofing & Siding, Inc. today at (815) 788-6699 for a free estimate on your siding installation or repair needs, or fill out our convenient online request form.